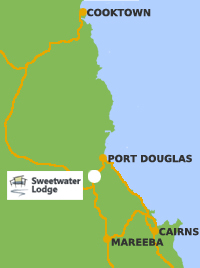 Welcome to Sweetwater Lodge, Private Luxury Retreat offering Unique Rainforest Accommodation in the Port Douglas Hinterland/Northern Atherton Tablelands. Surrounded by the magnificent Mt Lewis mountain range in the Port Douglas Hinterland and at the northern tip of the Atherton Tablelands, Sweetwater Lodge offers private luxury accommodation where you can relax and unwind while enjoying nature’s bounties and the magical atmosphere of the rainforest. Your hosts, Glenn and Wendy Cambage would like to share with you their beautiful 160 acres in the rural community of Julatten, encompassing private rainforest, tall eucalypt woodland, and native landscaped gardens. With just two exclusive luxury architect designed eco retreats Sweetwater Lodge, Julatten’s premier bird-watching accommodation, offers just 4 guests at any one time to enjoy our tropical private paradise. Perfect accommodation for couples. ½ hour from Port Douglas and the Great Barrier Reef, Mossman Gorge, Daintree National Park and the heart of the Tablelands, also known at the Atherton Tablelands. 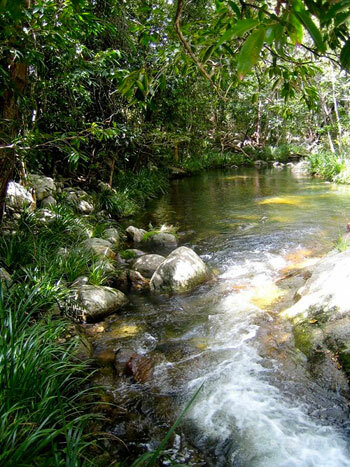 A scenic coastal drive just over an hour from Cairns International Airport. 45 minutes to Daintree Ferry, Kuranda, the Waterfall Circuit and the Lakes Region, and literally at the gateway to the rugged beauty of the Cape York Peninsula. Sweetwater Lodge strives for industry excellence with minimum impact on the environment and living in harmony with our surroundings.